Sentient animals have the ability to feel pain and suffering as humans do, therefore we can relate to their plight. The vivisection is hidden from the general public and even students, as many were shocked to hear the university took the lives of 1,182 mice this year. It’s cruel and inhumane. Protests like this used to be relatively commonplace. In most towns and cities local animal rights groups campaigned against animal testing. A few became so popular they assumed national significance, most notably the one against a new laboratory at Oxford University from 2004-08 which drew headlines in newspapers and tv coverage. This does not happen anymore. In fact since I started this blog in May 2014 one of the enduring themes has been the decline in the anti-vivisection movement, not only here in the UK but elsewhere too . Research shows opposition to vivisection worldwide has plummeted to negligible levels. I will be exploring the reasons for that and what, if anything, can be done about it in an article next year. 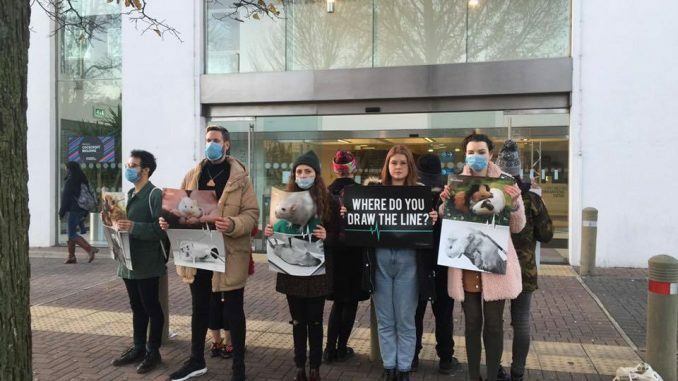 In the mean time we should be thankful to those activists who are still speaking up for the millions of animals tortured to death in British laboratories. Mel Broughton, the driving force behind the Speak campaign against Oxford University, has revived the weekly protests there on Thursday afternoons. There are also still occasional demos against Sequani laboratory in Ledbury by Hereford Animal Protection League.